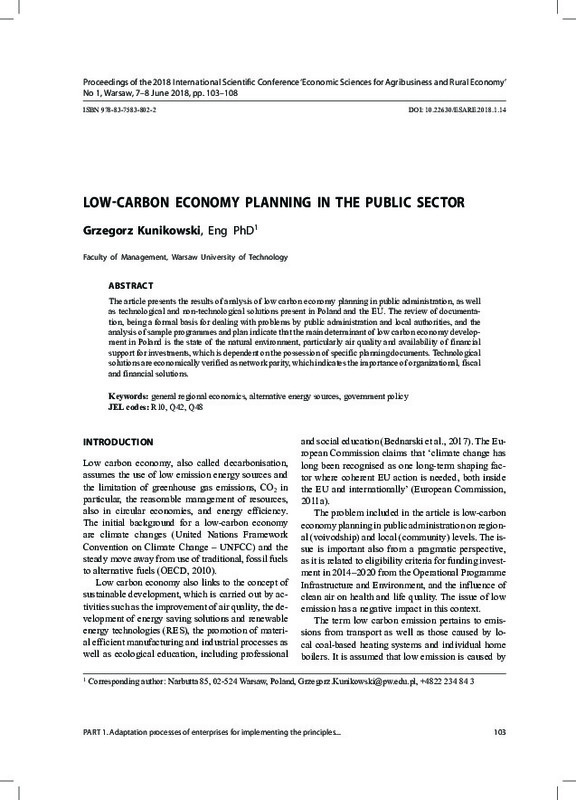 The article presents the results of analysis of low carbon economy planning in public administration, as well as technological and non-technological solutions present in Poland and the EU. The review of documentation, being a formal basis for dealing with problems by public administration and local authorities, and the analysis of sample programmes and plan indicate that the main determinant of low carbon economy development in Poland is the state of the natural environment, particularly air quality and availability of financial support for investments, which is dependent on the possession of specific planning documents. Technological solutions are economically verified as network parity, which indicates the importance of organizational, fiscal and financial solutions.